The best line –Dwight: Listen, can I talk to you for a second? Dwight: Look, I’ve been thinking. We had a good run. We really did. But you don’t need to worry about this whole contract thing anymore. Dwight: It’s just that we both-we want different things. You know, I want a big family. Dwight: No, no, no, no. I want a big family. Tall. Thick. A big, physically big family. Listen, you go have fun. You’re off the hook. Angela: But we signed the contract. Dwight: Dissolved. Don’t worry, you’re free. Okay? Okay. See you later. The best moment – When Hide tells his story to an impressed Darryl. 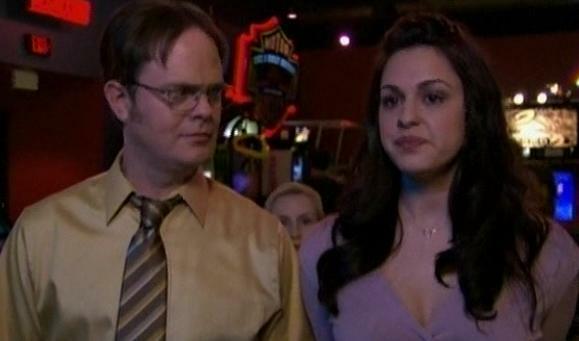 The best storyline – Dwight and Isabel, may they make a big family. Notable guest appearance – Kelen is back. God love her. Donna, played by Amy Pietz, plays Michael’s next romantic mistake. Hide, Darryl’s rescued heart surgeon, is played by Hidetoshi Imura. Would Michael have been reprimanded? – Nope, not here. One of the better Novak episodes, given that he presents many of the characters in their best light. He brings Andy and Erin up to the precipice and then reels them back. Dwight has found his match in Isabel. I can only hope she becomes a regular at some point. Donna and Michael have a good beginning. Seeing Kevin yell at Pam’s breasts is one of those moments that will live on for years. Seeing Oscar on the prowl takes away some of the mythology of homosexual relationships. His portrayal is one of the most positive ever seen on TV of a homosexual. Believability is the key. It’s not all Will and Grace histrionics. All this, and I managed gleefully to avoid speaking of “Date Mike.” Mark my words, Darryl should be the next manager. Next Post Piranha 3D should not be taken seriously. Seriously.